I know what you are thinking, “Yet another book published by MIT Press?” Well, unapologetically, yes. As I dig into their inventory of game studies books, my library continues to grow with incredible reads on the topic. 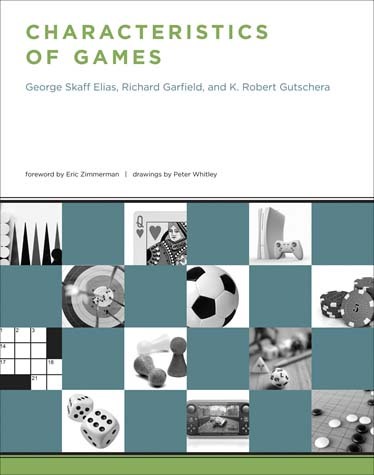 Characteristics of Games captured my attention because it has a forward from Eric Zimmerman, who wrote Rules of Play, which I found a fascinating and fun reading textbook (a fun textbook?! yes, go check it out). The question is, can systems be dramatic? Can math be breathtaking? Can numbers move your soul? If you study, or play, or make games with any kind of depth – whether your game is poker, basketball, Scrabble, Tetris, or Halo – you already know the answer. So let this be a warning: playing a game may be an exercise in pleasure, but this book is not easy reading. It is difficult fun, stuffed with hard-won insights that are not laid out on a silver platter for easy consumption. But if you take the time, this book will open our eyes to the beauty of games. Being fascinated by game studies and having a background in math and systems, I was really interested to check this book out. I was not disappointed. The authors delve into the math and systems of how games work and how we interact with them as players. This is not a book on Game Theory, so don’t be scared off that this is only a math book. This book explains how math and systems relate to the mechanics of games. If you really want to delve into the crunchy details of games so you have a deep understanding of their inner workings, then you will love this book. This is not a light read on the basics of game design, but instead it is a intellectual foray into the mechanics of games (characteristics as they call them). Whether you are into tabletop or digital gaming, the examples in the book will cover your interests. Do you enjoy “not-so-light” reading on games? Do you like delving into the intricacies of game mechanics and design? Let me know of other book titles you have found helpful. ← Traveling – Do You Take Your Freelancing On The Road?